In the New Testament, Matthew is first a tax collector whom Jesus calls into service as one of the original twelve apostles. Following the death of Jesus, Matthew preached the Gospel in Hebrew in Judea. During his later ministry his work focused on the Gentiles. Some sources report that he died of natural causes in either Ethiopia or Macedonia. Church tradition holds that he was martyred. Early church sources credit Matthew with writing a first gospel known as the Gospel of the Hebrews which survived him. According to one tradition, the original text was in Hebrew. This text was later translated into Greek but was lost. 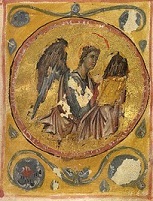 The Hebrew version was held at the Library of Caesarea and was copied for the use of Jerome in the 5th Century. Only writing fragments from Matthew's Gospel of the Hebrews remain. All full text copies have been lost. Some scholars attribute the authorship of The Gospel of Matthew (New Testament) to a late first century Jewish Christian. Christian tradition, however, credits the disciple Matthew with the work. The Q document is a theoretical lost source for the Gospels of Matthew and Luke which containing the sayings of Jesus in Greek. Though scholars speculate on its existence, no fragment has ever been found. The Gospel of Matthew is the first of the four canonical writings and presents Christ as the fulfillment of Jewish Messianic prophecies. The text focuses on the childhood, adult ministry, death and resurrection of Jesus. Though sharing material with both the Gospels of Mark and Luke, the infancy narratives are unique to the Gospel of Matthew. The most famous passages in this text include the Sermon on the Mount and the Great Commission. The Sermon on the Mount (Matthew 5-7), which has such notable passages as The Beatitudes and The Lord's Prayer, has presented a template for Christian discipleship for many notable world leaders, including Mohandas Karamchand Gandhi and Martin Luther King, Jr.